It is no surprise to those living in Portland that the frequent rain activity can have a devastating impact on the homes and businesses in the city. To successfully maintain your property in Portland, you must be prepared for water damage. The winter months bring bouts of heavy rainfall, with November through January being the wettest period. 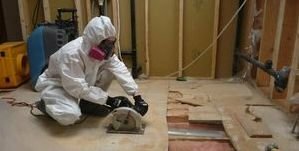 911 Restoration of Portland understands that flood damage restoration needs to be handled with quick efficiency to prevent permanent structural damage and mold growth. To prevent these issues the best we can, the water restoration crew guarantees to be at your door within 45 minutes of receiving your call for emergency flood cleanup services. We want you to feel confident reaching out to us no matter what time you need flooding cleanup services, which is why the staff is available 24/7/365 to offer assistance. 911 Restoration of Portland works with IICRC certified technicians, as well as being licensed, bonded and insured, to implement the highest quality, emergency water damage services to the property owners in Portland. It is important to us that everyone is on the same page with the restoration process, so call the repair technicians will provide property owners with a free visual inspection and estimate. The storm systems that tear through Portland in the winter can be especially damaging to homes and small business that are not prepared to take on the impact of heavy rain and powerful winds. The rainfall can cause water damage to wood structures and eventually create mold on walls, ceilings, and other surfaces of the property. To prevent structural damage and mold growth, the experts use top-of-the-line equipment to administer flood damage restoration. On top of offering flooding clean up, the technicians also make sure to find the source of the invading water and make the appropriate repairs to prevent these residual damages from occurring. The water cleanup agents understand that it is also essential to get the living space sufficiently clean after it has been flooded, but sometimes it can be hard to hire the right company when you have concerns about the price of the water remediation. To put your mind at ease, the technicians will provide property owners with a free visual inspection that includes an estimate to make sure that you understand the scope of the work before they begin. 911 Restoration of Portland wants the water damage restoration process to be as comfortable as possible. So, call us when you need emergency flood cleanup services, and we will walk you through the entire ordeal, one step at a time. Mold and fungi are prone to living in parts of the property that you can’t always see, which is why we want you to be aware of the other signs that may notify you that mold is living in your space. The repair techs have both the experience and the skill set needed to clean every corner of your home thoroughly. The mold experts know that if you can’t see dark patches on any surfaces of your home, then you might be able to smell the mold. We want you to be aware of the distinct, musty odor that fungi and mildew have, so if you notice that smell, then you probably have mold growing throughout your home or business. We are meticulous with our procedures because the mold specialists make it their top priority to leave your home looking and feeling like it never was affected by an infestation. Call the mold removal technicians when you suspect that mold removal is needed in your property, and we will go the extra mile for you today. Raw sewage is a highly toxic material that can contaminate your home, food, and anything else that comes into contact with it. When dealing with a sewage backup, it is essential to call on the professional. When you have a pipe burst that floods your basement with black water, or heavy rain overwhelm the sewer system, causing sewer water to erupt from your toilet and into your home, it goes without saying that you need help and fast. 911 Restoration of Portland is trained to provide safe sewage cleanup services to property owners throughout the community. Since sewage poses a series of health risks to everyone handling the substance, the crew members wear full HAZMAT gear and use high-tech machinery to remove all wastewater from the property and dispose of it correctly. The Portland sewage professionals use industrial strength products to remove the black water and all of the odor that it creates inside of the property. Sewage restoration can be a dirty job, but there is no reason you should have to deal with it on your own. Call the sewage cleanup unit today, and we will get your property looking and smelling fresh again no time. Once the flames in your property have been extinguished, the Portland crews will start performing fire damage restoration services that deal with smoke removal, deodorization, and water damage cleanup. When you have a fire, you are not only left with blackened, charred areas of the home with floating piles of sooty debris, but there are also large amounts of water left from the fire hoses. 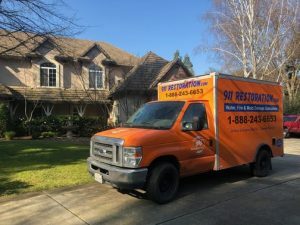 When you call the specialists at 911 Restoration of Portland, the technicians will perform advanced restoration techniques and water cleanup functions that deal with all aspects of the fire damage. We value professionalism in every situation, especially when a fire is involved and tensions are running high. The repair techs always put the customer first, and we do this by offering emergency pack-out and storage services, as well as taking over the filing of your insurance claim if need be. If you’ve recently had a fire in your home or business, don’t wait for the ash, smoke, and floodwater to get worse through stagnation. Call us for immediate fire damage restoration services as soon a the fire department has left your property. Natural disasters can damage your property in many different ways, but the main ways most property owners experience disasters in Portland are through earthquakes and floods. If you experience flood damage or structural issues caused by any disaster, you can depend on the technicians at 911 Restoration of Portland to arrive quickly to implement restoration services. To be there for you consistently throughout the disaster restoration process, the specialists in Portland stay as accessible around the clock to answer any questions you may have regarding the reconstruction work. By offering this level of customer service, we hope to keep customers feeling calm throughout the entire disaster remediation process, even if it means leaving your home while the reconstruction takes place. The goal of our repair workers is to get your property looking like a disaster never took place. So, call 911 Restoration of Portland today, and the highly technicians will show you how a disaster can actually become a fresh start.